So far, all of the designers on the New York Fashion Week catwalks have all agreed on one- it is ‘back to black’ for A/W 2012/13. My designer of choice who has presented his latest collection is Prabal Gurung, whose mixed of satin, cobalt, gold, white and black create an electrically shocking mix of textures and colours. Although there are some hints at similarities between his collection and some previous Alexander McQueen work, he has ultimately come out well, mixing up the rich hues with similar shots of black and cobalt on the eyelids. Some of the materials had a definitive futuristic feel, from the hologram black coat to the jet black belts and edges on the light dresses. 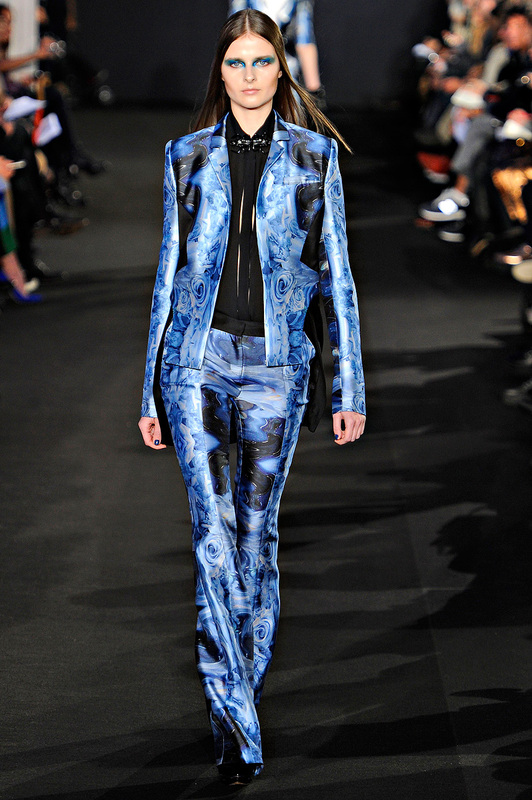 As to patterns, the designer chose kaleidoscopic blue roses and animal skulls, which he spread on the whole material. Combined on the satin, the dresses call for pure elegance which is slightly stiffer than the breezy S/S 2012 collections. With gauzes and chiffons used only for the ruffles on the black and the white pieces, the designer extends sleeves and gives them a lighter air. Seemingly, the designer does not only focus on dark colours- he brings in white and combines it with rich gold calling to mind gold leaf for a very light winter feel, exaggerated even more by the wisps of chiffon gently surrounding the dresses. He decorates the dresses with sequins for a slippery look and adds glass beads on the bodice for texture. Making sure not to back away from the young aesthetic of the company, Prabal Gurung decided to blend in a small part of cowboy into the collection. With tight collars and the skull brooches pinned at the neck in gold and black, the shirts and jackets focus more on the top part of the body, although usually if this is done, the lapels are quite large, which the designer has swapped for very small ones, mostly bringing focus on the neck. The wide leg of the satin trousers is also going along this trend, adjusted for the tightest fit in the thigh, spreading out over the knee with the classic fold of the professional. The designer is also on the pulse with the other designers. He brings out modern plastic materials, which is a big step forward in 2012, seen on virtually all the catwalks for S/S 2012. He folds them in tightly with chiffon and ostrich feathers for the lightest dress in the collection. He groups each material, so there are touches of ostrich feathers, chiffon and the plastic right next to each other, overlapping, giving this dress a three-dimensional feel, only emphasised by the strong black belt strapped tightly around the waist. A lot of impact is put on embroidery- this kind is what is usually associated with Alexander McQueen, with smatterings of embroidery sliding over the chest and the shoulders, bringing out a gothic theme. The difference being that Prabal Gurung adds tiny jewels all over the embroidery, which makes the dresses seem 3D. Only barely touching the flapper trend, he extends dresses downwards and adds swishing ostrich feathers for more focus on the movement. The collection all in all seems focused on the past (through the skulls, the black and the embroidery) and the future (through the plastics, holographic materials on the coat, white and the blue roses). The collection is extensive and rich- the designer has focused not only on following the trends but developing the artistry in his work. Without a doubt, the first pieces to go from the collection will be the jackets and the coats, which are the most wearable, although the dresses combine perfectly with the S/S aesthetic, meaning that they will probably be used as examples for the clothing production giants for their winter collections. All photos are from Vogue.com, no copyright infringement intended. I am very excited about coming winter, watching runways makes me go straight to september and start winter shopping again. The black coat with hologram arms is marvelous.